So far, this one was created in a very similar process to that described in the original “World Turning” post. It started with a watercolor background in M. Graham Azo/Aureolin Yellow and Nickel Quinacridone Gold, and then once that dried, I went back in with some M. Graham Phthalo and Prussian blues in watercolor. Added some Winsor and Newton Green Gold and some M. Graham Viridan in Acrylic Heavy body paint. I really do like the M. Graham acrylics; they are creamy and very vibrant, much like their watercolor pigments, and less expensive than Golden. However, Golden fluid acrylics (the paint is like silky heavy cream and very richly pigmented) are unique to Golden, as far as I know, and of all of the acrylics I’ve tried, their fluid paints are the ones that call me back time after time. In my opinion, they are worth the money, because a little goes a very long way, there is a wonderful range of colors, and they can be watered down for watercolor effects, yet you retain the vibrant hues. I do think this one calls for more depth, so I’m not calling it finished yet, but I’d love to hear your thoughts, and maybe sleeping on it is a good idea too. Well, we made it to Friday! Time to shake thy tailfeathers! Can anyone believe August is almost here?! I think World Watercolor Month is making it fly by even faster than normal! Peace and a Happy Weekend to all! I really like this one, Laura. There’s a kind of optimism in your art that’s hard to describe… peacefulness, I suppose. Thank you Steven. When I sit down to paint, peace always follows behind. I’m really glad you enjoyed this. I can’t remember if you liked the first painting or not? Wondering if this needs more. I think it definitely does but I may need to cogitate for awhile re what. Love those colors – bravo! Thank you Frank! So glad you enjoyed it! Wow, thank you so much for saying so! I really appreciate it! Thanks Kerfe. You wouldn’t add anything? Oh no, it looks great. And yes, we did have orbs on the brain today! Hmm. Ok thanks. Yes! Maybe we are starting to wish we lived in space? Well space with oxygen would be nice. Laura! I’m practically speechless! Another jaw dropper! How did you do those beautiful white markings – they almost appear stamped. the depth and color and movement of this – O M G !!! Thanks! They are stamped, it’s that gesso resist, it seems to work out really nicely! Can’t seem to leave acrylics totally alone for a whole month lol. I have been saving items that I’d normally toss or recycle if they look like they’d make interesting impressions. I have some stencils but I don’t like using someone else’s art as part of my work that much. I’d like to cut my own but I don’t take the time to do it. But stuff anyone else would toss…….even though I didn’t make it, I’m putting it to a creative use! So I go ahead and use it. Glad you like it! Gesso is the cure all for everything lol. Yeah I discussed in a little more detail in the first World Turning post. Time was short yesterday. I still feel like this is unfinished tho…….just don’t wanna mess it up. You painted a creation story. I love it. Like everyone else I think this painting is absolutely stunning! Its somehow delicate and bold in the right amounts. The white stamped areas makes it look like an old world map of sorts… LOVE it! Wow, thanks Laura! I so appreciate your kind words! Have a wonderful weekend. Really glad you enjoyed the painting! I love this one too and I love the comments your other blogging friends made. This might be among my “Laura Favorites”, but I know there is so much for exciting work to come from you! Thank you so kindly, Tierney! I’m enjoying this series. Lots of fun! I like the energy in this piece. Stepping away for a day or more is an amazing experience, we see it with totally new eyes and know if it’s done or what needs to be added. Laura, this looks three dimensional and I love the depth and richness of the colors. I agree with the others that it’s a favorite. Wonderful composition, good depth – like the colors too! Looking forward to seeing what else you do with the piece. I see depth there and with abstracts, is depth as important? if you convey what you want or feel, then it is alright. I really love this one and after taking another good look at it, the spheres (world/s) are floating and it creates its own depth, very interesting! I love your imagination and those white swirling world images is very, very cool. I can’t see adding anything else in my opinion. Outer Space meet underwater world meets scifi…brilliant! Thanks so much Johanna! So glad you enjoyed it! This is pretty. I am not touching it, but I want to! 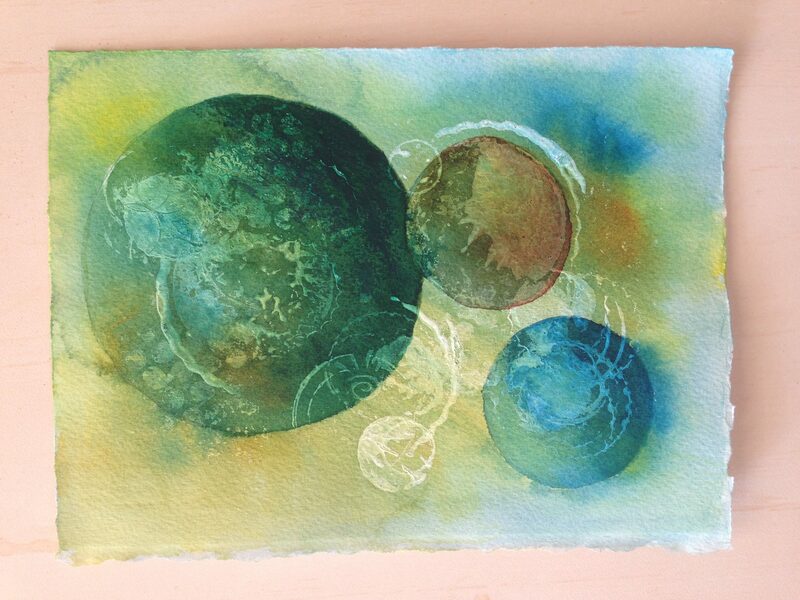 Beautiful colors, love the gesso resist stamp – it evokes spheres of other worlds for me. I agree with you that some depth would be good – perhaps darken the background in some places to give each sphere it’s own “space”? Thank you very much; that’s just about the kind of adjustment I think this one needs. Much appreciated! I have a title for your painting “Green Galaxy” 🎨💕Your creation is absolutely stunning Laura! Wow, thank you, Snehal – I love that name! I love your work but this one is particularly beautiful. Someone mentioned “peacefulness” and that sums it up for me. And here I was admiring the depth you achieved! This is a fantastic painting, Laura. Thanks so much, Andrew; I seem to be stuck in small for the moment. I appreciate your comment. Thank you, Rebecca; you always have a way of making me feel great. I really appreciate your kind comment. Beautifully cosmic and wonderful. Love the depth and texture, the repeat patterns in different methods are lovely to see. Thank you for sharing. Thank you, Haunani, for stopping by and for your kind comment. This is beautiful, Laura! 😍And I see a lot of wonderful depth there. I thought it was complete! And yeah…this month is zooming by! Only a week left!! Hope you have an amazing weekend!! Oh yes, or maybe your late night hallucinations lol!